I hope this isn't presuming too much, but this reminds me very much of the feeling of overwhelming anxiety. It has a very emotional affect, besides being so dark. I like it. Very dark. 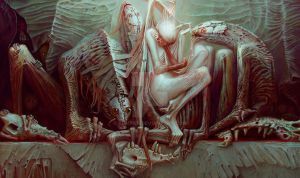 Very cool , very Beksinski like , but very VERY cool and done with maestria ! I just like it in so many ways. Good job! C'est une oeuvre d'art .... !!!!!! What art supplies do you use for this? wow- beautiful (in that grotesque way)! The only thing I would suggest is to give them all smartphones and it would perfectly reflect my experience in the subway- I am usually the only one not completely focused on my phone- they seem like zombies and remind me very much of your painting! The original sketch was exactly so. .
After some time, I had decided to simplify. I left only a hint. delicate association ... But nevertheless, you notice it . Funny how our minds were parallel, and I am glad I am not the only one who feels like this on the subway. PS. I'd love to use this as a wallpaper on a high def monitor. If there's a higher rez version you can post I'd love it. Thanks again. Very nice. The colors are well chosen. The pulling down of faces original. Thanks for sharing! Fine colors and textures in this macabre piece. This reminds me of the dementors off of Harry Potter. very intriguing, and a little scary weird. This is very Beksinski-esque. I like it. The ugly duckling of horror!